Hoamatkas Alp Cheese in Hay DEGUST approx. 1 kg. Buy now this product together with Imperial part bacon Fesa bacon Villgrater approx. 600 gr. ready for shipment: in ca. 5 days Imperial part bacon Fesa bacon Villgrater approx. 600 gr. Deutschnofner caraway cheese cheese dairy Learner ap. 850 gr. Cut cheese bovine milk, Appearance: orange cylinders, Aroma: intensely after caraway, Flavour: spicy, Consistency: rubbery - melting, Maturation: until 6 months. Fioretto Pecorino Sepi approx. 750 gr. 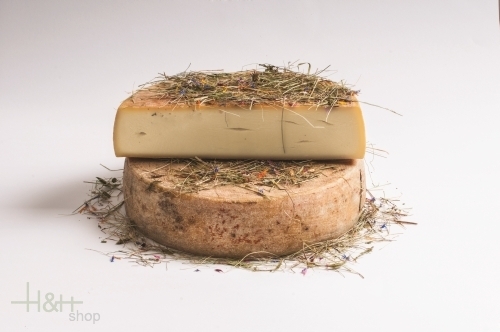 Cut cheese ewe's milk, Appearance: nutty-brown colour - ivory white interior, Aroma: mediterranean herbs and sheep's milk, Flavour: harmonic presence of sheep's milk - nuts, Consistency: rubbery, Maturation: 8 weeks in the refining cell. Noagnlailich Mignon ® Cheese DEGUST approx. 330 gr. Maja Cheese DEGUST app. 150 gr. Miwa Cheese DEGUST approx. 600 gr. Henricus Cheese DEGUST approx. 800 gr. Sextner cottage cheese approx. 500 gr. - Cheese dairy Sexten 9,20 EUR / 18,40 €/kg. Sextner grey cheese approx. 600 gr. - Cheese dairy Sexten 9,50 EUR / 15,83 €/kg. Innichner mountain cheese appr. 500 gr. - Dairy Three Peaks 9,70 EUR / 19,40 €/kg. only 50,80 EUR / 20,32 €/kg. Mild approx. 650 gr. - Cheese dairy Sexten 10,80 EUR / 16,62 €/kg. Sextner grey cheese form appr. 1.2 kg. - Cheese dairy Sexten 16,95 EUR / 14,13 €/kg. Kasus approx. 500 gr. - Capriz Fine Cheese 16,80 EUR / 33,60 €/kg. Formaggio Dolomitenkönig Mila ca. 500 gr. 10,00 EUR / 20,00 €/kg. Gran Spicchio Cheese Mila ca. 300 gr. 9,35 EUR / 31,17 €/kg. Kasus Caverna approx. 500 gr. - Capriz Fine Cheese 19,60 EUR / 39,20 €/kg. only 142,50 EUR / 15,83 €/kg. Kasus Caverna whole loaf approx. 6 kg. - Capriz Fine Cheese 182,35 EUR / 30,39 €/kg. Bierkas approx. 200 gr. - Capriz Fine Cheese 9,35 EUR / 4,68 €/100 gr. Roggenkas Cow approx. 200 gr. - Capriz Fine Cheese 9,45 EUR / 4,73 €/100 gr.